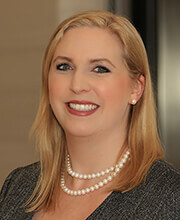 KATJA M. GROSCH is an attorney with the law firm of Vogt | Resnick | Sherak. Ms. Grosch’s practice is focused on trust, estate, conservatorship, and probate litigation, in which she represents clients in a range of capacities including as trustees, beneficiaries, executors, creditors, and heirs. She also represents fiduciaries in the administration of estates and trusts. Her practice draws on a decade of civil litigation experience. Ms. Grosch uses her comprehensive knowledge and compassionate approach to client concerns to litigate and resolve matters to her clients’ satisfaction. Ms. Grosch is a member of the California State Bar, in the Trust & Estates and Litigation sections, and Federal District courts in California. She is also a member of the Orange County Bar Association, in the Trust & Estates section. Ms. Grosch obtained her Juris Doctor degree from Washington University of St. Louis School of Law, where she was a member of the Dean’s list and received two CALI Awards, in Copyrights and Critical Jurisprudence. Ms. Grosch received her Bachelor of Arts in Anthropology, with high departmental distinction, in just three years from University of Illinois, Urbana-Champaign.